Burnout shows its ugly face in many different situations and is caused by numerous factors which may actually be in your control. Most of us fail to see it coming though, and that is the real problem. We continue burning a candle at both ends of the stick without a worry until we’ve exhausted ourselves to the point of a breakdown. There are sayings that aim at providing a bit of relief. “Failure is not the opposite of success, it’s part of success,” by Arianna Huffington. “Difficult roads often lead to beautiful destinations,” by Unknown. “Sometimes things have to fall apart so better things can come together,” by Marilyn Monroe. The internet is full of them. We all get those quotes but when you’re actually going through a burnout, none of them are helpful. Hopelessness kicks in and you start to question everything. It’s interesting that my burnout didn’t come from a feeling of being overwhelmed at first as most burnouts do. A lot of my of clients express to me that they feel completely overwhelmed all the time but I never felt overwhelmed because I had a process and system for everything. I was just going, going, going and was fine with that. 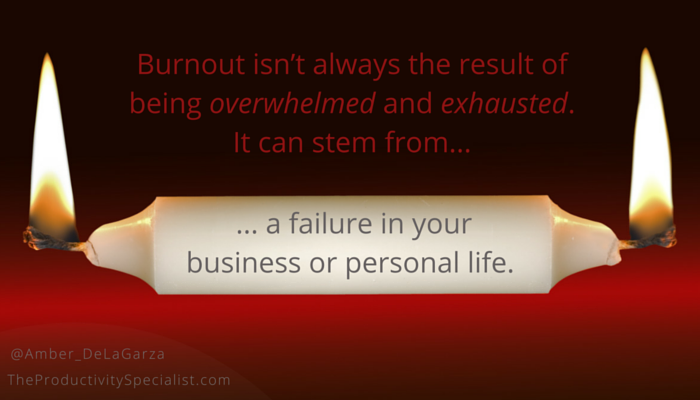 I believe my burnout was initiated by a huge disappointment in my business. I had been working on a project wholeheartedly, putting my blood, sweat, and tears into it. I envisioned where it was going and how it was going to be super successful. When it wasn’t, my fire – my drive for my business, fizzled out immediately and completely. When that passion disappeared I just didn’t know what to do with myself. The excitement that would wake me up at three or four o’clock in the morning to work in my office and drive my business just wasn’t there. After going through my first personal burnout and coming out of it with renewed focus, I feel I learned a few lessons that may be helpful for other entrepreneurs and business owners. I put all of my time, energy, and passion into one specific project in my business so when it failed to come to fruition, I didn’t have a backup plan for what I was going to do with my time. That was THE direction I was going to take my business. The burnout wouldn’t have been so devastating if I had had multiple projects going on, streams of revenue coming in, ideas to think through, or a backup plan for my time. We need to be more versatile in our businesses, have multiple streams of income, and keep numerous opportunities in our back pockets. That way if one idea, plan, or project doesn’t work out, we can always work on another one. As a business owner myself, I know that your business is your baby. You put your blood, sweat, and tears into managing it day in and day out which means it has become a large part of you. That also means it is hard to distance yourself, your self-confidence, and your ego from it. At first I felt extremely guilty that I didn’t have the same passion for my business that I once had. I was at a loss not knowing where I was going to go next. To tell the truth though, I never once thought I wanted to go back to the corporate world. I never thought for even one second about clocking in nine to five so I can’t say it got that bad, but the burnout bled out into all other areas of my life. I took a personal hiatus as well. I needed that time off. I wasn’t go, go, go like I had always been because I couldn’t be. Taking a lengthy break from my business and personal agenda was necessary to fully recover from my disappointment. At the root of it, my burnout really stemmed from the initial overwhelming disappointment from a failure in my business. Once I finally got around to assessing why I burned out, I faced the reality that I needed that time to step away, evaluate the direction for my business from a fresh point of view, and strategize where I want to take it next. 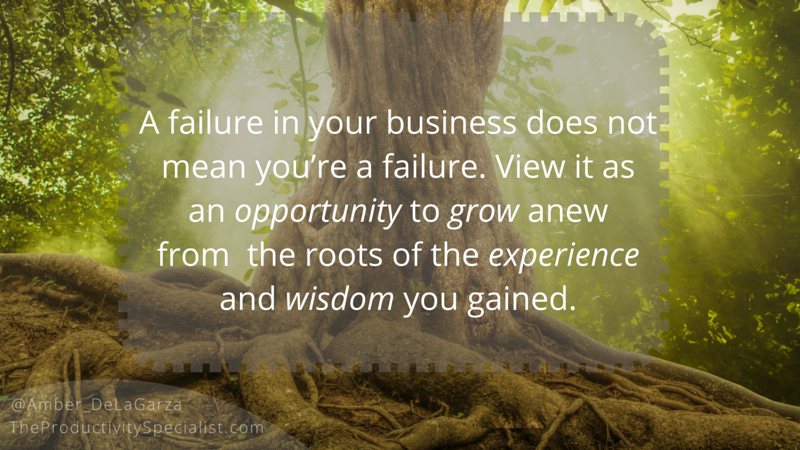 Just because you have a setback or failure in your business does not mean you’re a failure. It means you hit a rough patch and have been presented an opportunity to grow anew from the roots of the experience and wisdom you gained. Could I have avoided burnout? No, at least not at the speed and not in the way I was going. I was sprinting as fast as I could toward a single goal without pausing to check if I was training with the right coach, warmed up, wearing the right shoes, or even staying within my lane. My burnout happened because I was taking care of only one single need in my life and neglecting all the others. 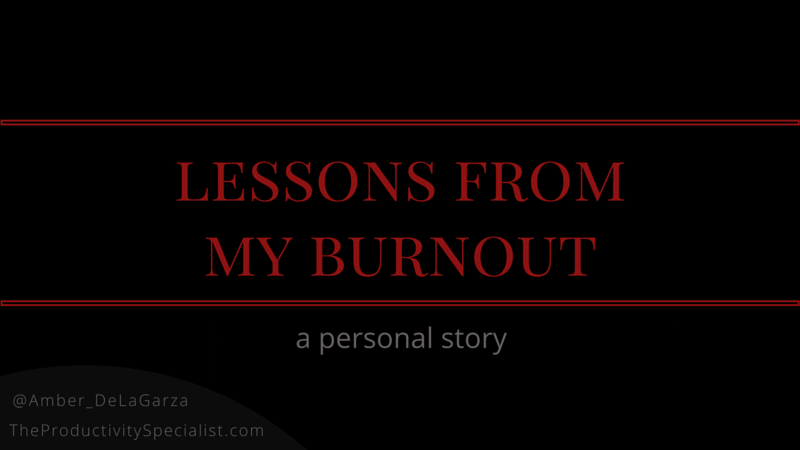 My burnout had to happen in order for me to learn from my mistakes, rejuvenate, and grow. My burnout forced me to disconnect and totally relax. Take a breather. I can’t recall the last time I did, if ever. My burnout lasted for six whole weeks. I totally dipped out of my business, doing only the minimum, and seeing only a few clients for well over a month. I hadn’t done that in almost four years of being in business, even for a week. I had been full force all the time and was apparently due for a break. While I do believe my burnout was a necessary part of my growing process, it does not need to be part of yours because burnout is avoidable. Whether you are exhausted from attempting to run a marathon and quickly losing stamina or sprinting to a finish line like I was, you can stop burnout in its tracks. Everyone has a different reason for burnout but ultimately, it is caused by a lack of self-care. Are you taking care of yourself or just your child/project/goal/business? Are you getting enough sleep? Maintaining positive and supportive relationships? Putting undue pressure on yourself? Working toward more than one goal or idea? Able to settle for less than perfection? Taking needed breaks? When the symptoms of an oncoming burnout start surfacing, take the proactive approach. Disconnect for an hour, a day, or even a week. Tap out. Rejuvenate. Take time to debrief on what’s not working and strive to change. Purposefully refresh then recalibrate. You can avoid burnout by recognizing its causes and altering your habits. I’m not going to lie. My burnout had me lingering in a pretty dark place for a while. I was drifting in total limbo, oblivious to which way was up and which way was down. I was disappointed, confused, and lacking the passion to undertake anything. I had stumbled, been bruised, and didn’t know where to take my business next. That brought up a LOT of questions. Tough questions. But those questions made me think and assess and dream, and once I mustered the energy and strength to give it a go again, I answered all of them. I designed a new plan for my business and am excited about the direction it’s headed. I am back in the office every day. I am attacking my ideas and projects with passion and a renewed sense of purpose. I hope a burnout doesn’t have to be part of your story like it had to be mine, but if so, I hope you approach it as only a chapter, not an entire book, and embrace it as the growing opportunity it can be. rejuvenate, recalibrate, and avoid a lengthy burnout.